Lina Tipnis belongs to that band of designers who has steadily climbed the ladder of success with hard work and a disciplined business sense. 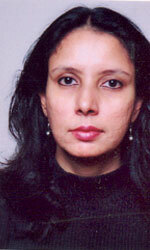 Lina began her career by designing in 1987 for her retail outlet at the Oberoi, Mumbai. She is quite honest about her background when she says," I am fortunate to have an inborn desire to create garments"
After having retailed for 5 years, the next logical step was manufacturing. In 1992, her label sold Indian semi formal and fusion co-ordinates to select stores in India and abroad. In 1996, she launched her label LlNARIKA which is now sold in over 30 stores in India as well as the U.K., Southeast Africa and the Middle East. While the Indian semi-formals are marketed through' these outlets, the fusion lines with a very international flavour are aimed at the European markets. Today, the label has a loyal customer base amongst its target audience profile. In 1997, Lina was invited to showcase her collection at the world's largest and most prestigious garment fair- CPD (Collection Premiered in Dusseldorf) hosted by the IGEDO Company where she launched her signature label 'LINA TIPNIS'. Her collection received an overwhelming response. Ever since, she has been successfully exporting fusion lines to stores in Europe. These fusion lines which are available across Europe are simultaneously sold in India through stores like Melange in Mumbai, Ffolio in Bangalore, Ensemble, Amazor and Kaaya in Delhi, Elahe and Stanza in Hyderabad and Kali, Zenon & Espee in Kolkatta. Her much in demand ethnic prêt lines are sold through various chain stores in Mumbai, Kolkatta, Hyderabad, Bangalore, New Delhi, Chennai and Pune. With the philosophy of 'less is more', her garments are essentially minimalistic ensembles that are aimed at the urban woman. Emphasis has always been on engineering and wearability. Working on natural fibers -has been Lina's fortê. The reason for her success? It's her capability of having her finger on the pulse of consumer's needs and the ability to set new trends within the highly volatile fashion industry. Lina Tipnis has been exploring fusion couture for some seasons now, and has arrived at a look, which combines classic elegance with a soft sensuality. She has also used fashion for a cause. Post the Kargil war, she initiated and spearheaded an event with Melange wherein she roped in other designers to sell garments and sent the entire proceeds to the Kargil Army Welfare fund. Lina has also been a consultant to the Raymond group for setting up of their designer pret stores-'Be'; which involved identifying designers and merchandise for the store. The pioneering work undertaken by her over the last decade also won her the prestigious Indira Gandhi Young Achievers Award for 2002. She is always keen to work in collaboration with other designers to nurture the fashion business and give it industry status. "The market is very large and there's room for everyone. Designers must first work towards increasing fashion consciousness collectively and then create brand loyalties". Lina has carved a niche in the fashion business by moving into both genres of Styling. That is her formula for success besides her marketing and promotional skills.